NASA has published a Notice of Intent (NOI) in the Federal Register to prepare a Supplemental Environmental Impact Statement (SEIS) to the 2014 Final Environmental Impact Statement (FEIS), Proposed Demolition and Environmental Cleanup Activities at the SSFL . NASA will prepare this SEIS to comply with National Environmental Policy Act (NEPA) regulations, and as a result of scientific data gathered from NASA’s soil investigation since 2014. NASA is required to supplement the soil cleanup evaluation published in its original 2014 FEIS because the estimated quantity of soil required to be removed has increased substantially. The NOI confirms NASA’s firm commitment to achieving a cleanup at SSFL that is protective of public health and the environment, based in science, technically achievable, and minimizes impacts to the surrounding community and the valuable and protected natural, cultural and biological resources found onsite. The public will have an opportunity to comment on the draft SEIS and participate in public meetings after the draft SEIS is released later in 2019. For more information on the NEPA process and NASA’s NEPA Program: https://www.nasa.gov/green/nepa. 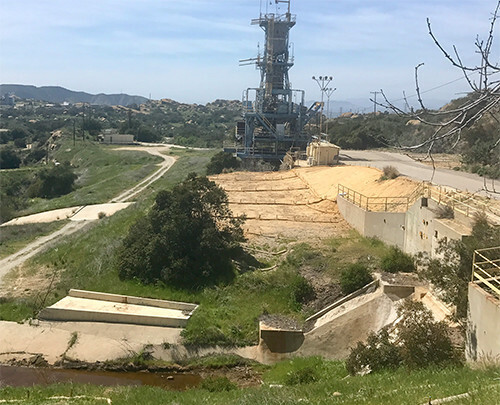 On March 19, the NASA Office of Inspector General (OIG) released an audit of NASA’s Progress with Environmental Remediation Activities at the Santa Susana Field Laboratory. NASA has released the December 2018 FieldNOTE newsletter! 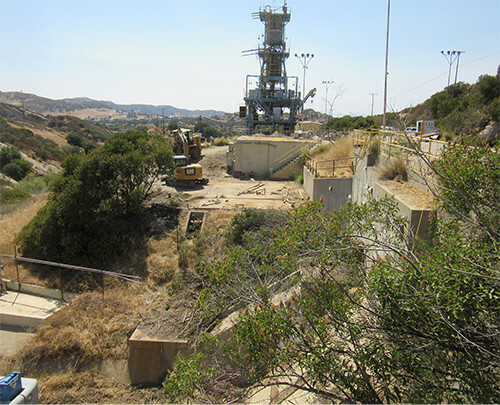 This edition reports on NASA’s latest activities at the Santa Susana Field Laboratory (SSFL) including groundwater cleanup, fluid evacuation at the test stands, and final demolition activities in NASA-administered areas at SSFL. 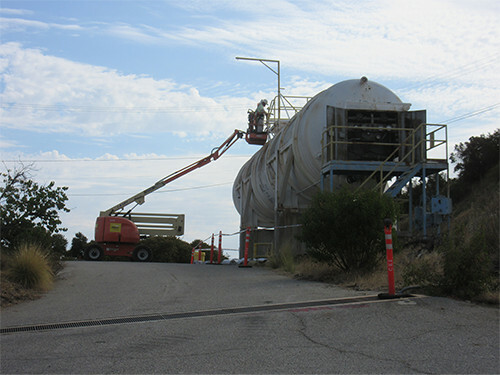 NASA’s Site Management Office at the Santa Susana Field Laboratory (SSFL) re-opened on Monday, November 26. A generator is powering the NASA site office until electrical power is restored at the SSFL site. NASA, the U.S. Army Corps of Engineers and contractor personnel are working onsite to recover from fire damage, install/improve stormwater best management practices (BMPs) and groundcover in preparation for future rain events, and preparing to resume demolition activities. This is the final status update. Subsequent Woolsey Fire information will be communicated in upcoming editions of the FieldNOTES newsletter or via news updates on this NASA SSFL website, as necessary. NASA’s Site Management Office at the Santa Susana Field Laboratory (SSFL) remains closed due to the Woolsey Fire and will remain closed to non-essential personnel through Friday, Nov. 23. Key NASA personnel have been onsite assessing fire damage to NASA-administered areas and working to re-establish safe working conditions before field activities resume. 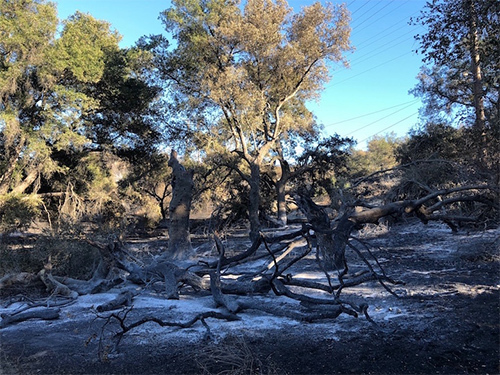 There are numerous down power lines and burned oak trees and NASA has been working onsite to mitigate fire damage, help clear the roadways and power poles, and repair equipment destroyed by fire. Fire damaged Coastal Live Oak photographed on Thursday, Nov. 15. Fire swept through areas located to the south of Service Area Road, including all three eligible historic districts. All Test Stands and associated Control Houses at Alfa, Bravo and Coca Test Areas are intact with no apparent damage beyond scorch marks near pedestals and a burned wooden staircase at Alfa 1. Cultural resources within NASA-administered areas are in good condition. All petroglyph and pictograph sites are unimpacted from the fire despite the fire extensively burning chaparral and Coastal Live Oaks in their vicinity. 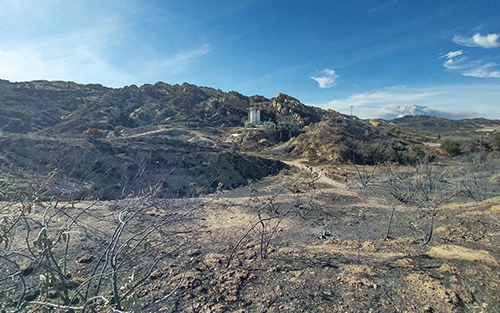 Woolsey fire impacted area with Coca Test Stand in the background photographed on Tuesday, Nov. 13. NASA assessments confirm no specific risks or hazards from the fire associated with contamination at the site. 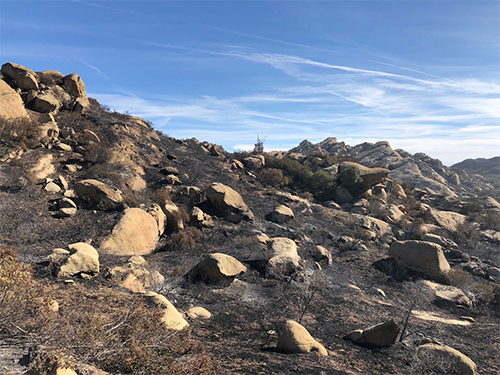 Fire and emergency responders, as well as state and federal agencies responding to the site, have determined the fire did not present any risks other than those normally present in a wildfire situation. Public agency statements are listed below. NASA continues to communicate and cooperate with fire and emergency responders, state and public agencies, Boeing, and the Department of Energy. NASA will continue to evaluate site conditions for safety and environmental concerns, and will continue to address onsite environmental infrastructure and management needs, and will provide relevant updates on this website as they become available. NASA’s Site Management Office at the Santa Susana Field Laboratory (SSFL) is closed due to the Woolsey Fire. The site is currently unsafe to access due to downed power-lines, blocked roads, residual spot-fires onsite and active wildfires in the local area. Only emergency response activities are permitted onsite at this time. All NASA SSFL personnel and contractors were safely and swiftly evacuated from the site the afternoon of Thursday, November 8th. On Friday November 9th, key NASA SSFL personnel were able to briefly return to the site to secure critical paper files, relocate a government-owned vehicle and conduct an initial assessment of fire damage. On Sunday, November 11th key NASA SSFL personnel were again able to briefly return to the site to assess fire damage in NASA administered areas. Initial observations confirm significant fire damage across the NASA SSFL site. Fire swept through all three historic districts. The Alfa and Bravo test stands are scorched but intact. The Coca and Burro Flats cultural areas have not been safe to access. NASA recognizes all wildfires can present threats to the public, however we do not anticipate any specific risks from the fire associated with contamination at the site. Fire agencies responding to the site have determined the fire did not present any risks other than those normally present in a wildfire situation. Additionally, the California Department of Toxic Substances Control (DTSC) is actively monitoring the fire, and DTSC emergency response staff, scientists and toxicologists have reviewed information about the fire’s location and do not believe the fire has caused any releases of hazardous materials that would pose a risk to people exposed to the smoke. NASA will fully assess fire impacts and damage as soon as it is safe to do so. We will continue communicating and coordinating with fire and emergency responders, Boeing, Department of Energy and State agencies and will provide relevant updates here on this site. Community questions about the fire should be directed to DTSC, Los Angeles County or Ventura County Emergency Services. 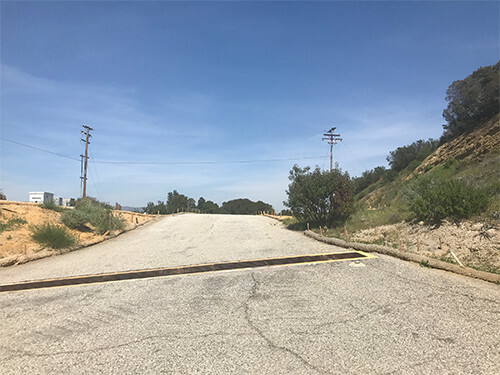 NASA has published a Notice of Availability (NOA) in the Federal Register for the Record of Decision for NASA Groundwater Cleanup Activities at Santa Susana Field Laboratory (SSFL). Guided by groundwater investigations and treatability studies, NASA is eager to move forward on groundwater cleanup plans. The Record of Decision (ROD) for NASA Groundwater Cleanup Activities at SSFL outlines NASA’s decision to proceed with groundwater cleanup technologies and strategies described in the 2014 Final Environmental Impact Statement (FEIS), Proposed Demolition and Environmental Cleanup Activities at the SSFL and serves to pave the way and accelerate groundwater cleanup activities in NASA-administered areas. The groundwater cleanup activities described in the ROD are intended to prevent contaminant exposure to human and biological receptors, reduce the potential for plume migration, and reduce contaminant sources. The results of completed groundwater investigations and treatability studies will guide the development of specific groundwater cleanup plans. NASA’s June 2018 FieldNOTE newsletter is here! This edition reports on the site wide baseline air monitoring program, provides an update about demolition, and describes NASA’s efforts to protect some of the historic structures at SSFL. These photos show the progress of the Phase 3-A demolition activities. Unless otherwise indicated, all images are provided by NASA.